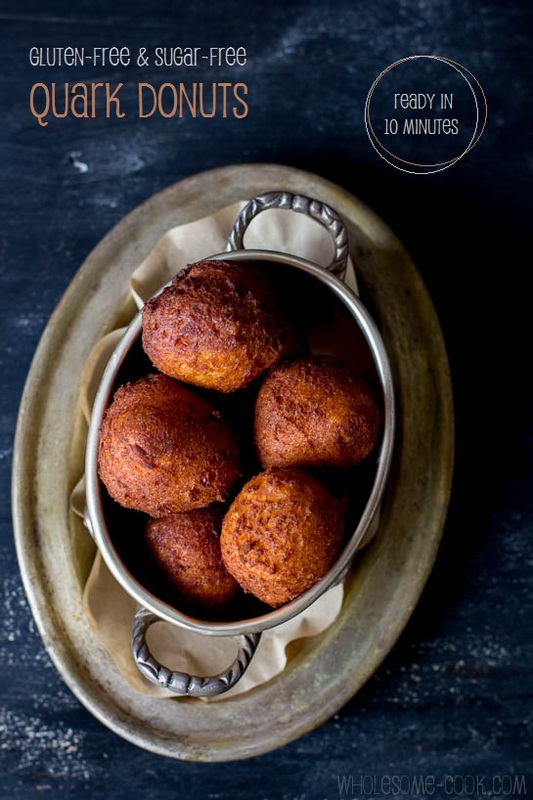 (As Featured in Mar2014 Nourish Magazine) These gluten-free and sugar-free Quark (Cottage Cheese) Donuts are exactly the way donuts should be: fluffy and light on the inside, golden and crisp on the outside. Sweetened with Stevia, they can be served with a side of a citrusy glaze but it’s not essential to the full enjoyment of this 10 minute treat. If there is one thing other than fresh cream eclairs that I can admit to being a sucker for (for a no-sugar version use Stevia drops and this icing), it must be the donuts. For the obvious reasons I keep away from store-bought varieties and since I am after more instant gratifications than a homemade yeast donut allows, I tend to go without. 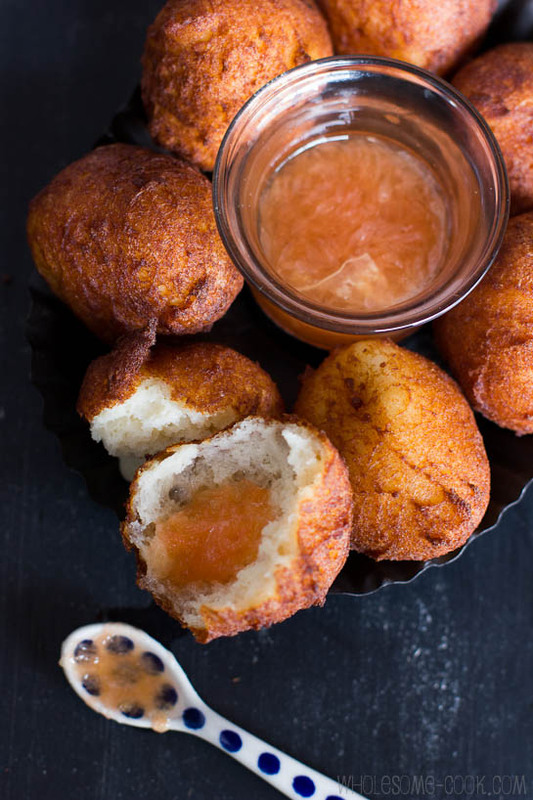 Until now, when after talking to Mum about some Polish racuchy [rah-tsoo-he] she’d made earlier, I’d decided to remake the Polish cottage cheese fritters into these bite-sized donut ‘holes’. And since the donuts only take 10 minutes to make, I am glad that these little munchkins are somewhat more healthy than your regular kind. Sure, they are deep fried, but if you use a good oil and only have them once in a while, they are a good alternative to what’s around in the ready-made aisle. One question you might be asking is: what is quark? Quark is a type of cottage cheese. The German-style variety is low fat and has a slightly more blended consistency than regular (granulated) cottage cheese and is less runny, but not as thick as, say, cream cheese. I used B.-d. Paris Farm Creek Biodynamic Organic German-style Quark – bought from Harris Farm, but you can usually find it in the same fridge section of the supermarket where you would find ricotta. I have not used ricotta to test this recipe, but I have a feeling that it would work just as well. As for the citrus glaze, it is optional. I used pink grapefruit but orange with a hint of cardamom or lemon with a pinch of cinnamon would also work a treat. Serve on the side for dipping to preserve the crunchy texture of the donut’s skin. 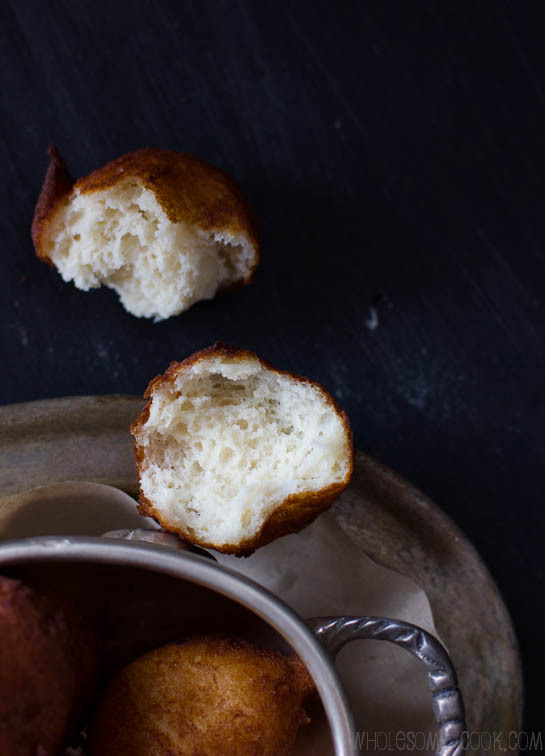 These gluten-free and sugar-free Quark (or Cottage Cheese) Donuts are exactly the way donuts should be: fluffy and light on the inside, golden and crisp on the outside. Sweetened with Stevia, they can be served with a side of a citrusy glaze but it's not essential to the full enjoyment of this 10 minute treat. Makes about 8. Beat egg and Stevia with a whisk or an electric mixer until pale and fluffy. Add lemon essence, bicarbonate of soda, quark, coconut flour and tapioca starch. Mix well to combine. Heat oil in a small saucepan over medium-low heat, oil level should be at least 1 inch, to 180C (350F). If you don't have a thermometer you can judge when the oil is ready by dropping a small crust of bread into the oil - if the oil bubbles, it's ready. Reduce heat by a quarter. 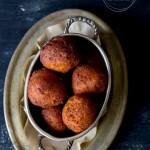 Using a tablespoon or a metal ice-cream scoop, shape dough into balls about 2cm in diameter. Drop them into the hot oil, 3-4 at a time and allow them to brown on all sides, before removing with a slotted spoon or metal tongs onto paper towels to drain excess oil. Repeat with the remaining dough. Mix citrus juice with rice malt syrup and serve on the side of warm donuts. Yuuuuuummmmoooo! These sound amazing! I am so going to make a batch for afternoon tea today. They look so yummy, like what my grandma used to make. I have to try this recipe! ten minutes? seriously? they look wonderful. Made these this afternoon. Lasted all but a minute! Will definitely make again. It’s fabulous to find such a great local site. Thank you for your kind words leasa, I am so glad you liked them – they are slightly dangerous because they are so easy to make. 🙂 PS Feel free to email me with any questions or recipe ideas you would like to see on Wholesome Cook. I’m always open to suggestions. You are amazing … these look absolutely scrumptious. I have just made yet another of your fabulous Pasticceria Papa Ricotta Cheesecakes, which has to be the best Cheesecake in THE WORLD. I find the best flour to use for the pastry is the Italian OO. I will definitely try these very soon. Agree with leasa what a great local site. *blush* thank you! Thanks for the tip on the cheesecake, I will update the page with your suggestion. 🙂 PS Like I said to leasa: feel free to email me with any questions or recipe ideas you would like to see on Wholesome Cook. I’m always open to suggestions. Hi Martyna, thanks for the great recipe. I live in Germany, so getting Quark is not a problem at all, but I’ve never even heard of tapioca starch. What would be a good replacement? And the coconut flour you mention – we don’t have that either. Can it be replaced with finely ground dessicated coconut? These donuts are called Quarkbällchen here. They are my daughter’s favourite snack. Thanks! Your gluten-free ones look so much better than the regular ones. I’ll try to get hold of the ingredients! Oh these sound so dangerous! I wonder if strained natural yoghurt would work in place of the quark? Did you say 10 minutes? WOW I’m in. I don’t mind deep frying so this sounds really wonderful to me! And love how moist inside these donuts! What a beautiful and amazingly quick recipe! Gorgeous photos too! Wow this is one to bookmark! I love quark! G’day! Don’t these look delicious, true! Your photo and recipe has now inspired me to put this on the list too! Forgot to add thats it so good to have someone from our own country with familiar products, love your website and have tried your risotta the other night and a great hit, ate the rest for breakfast even better the next day. That’s fantastic to hear Jessie! I like to intertwine some Polishness into my recipes and healthy them up. really good donuts. Ive baked these a couple of times. Oil is a bit temperamental. So I cooked these in a donut pan, took about 8 minutes at 180c. Yum.